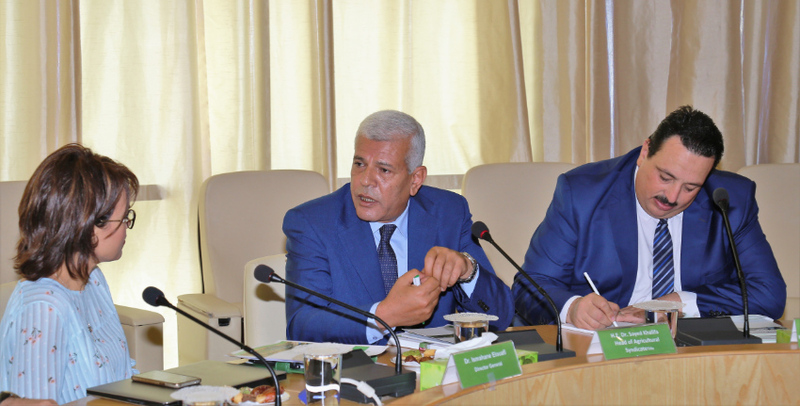 The International Center for Biosaline Agriculture (ICBA) today received a two-member delegation from Egypt to discuss potential areas for collaboration. During the visit, the delegation - H.E. Dr. Sayed Khalifa, Head of Agricultural Syndicate, Egypt, and H.E. 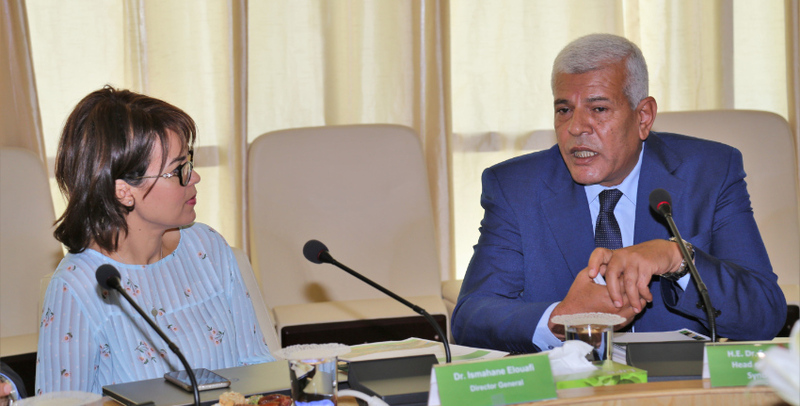 Dr. Ali Hazeen, Head of Development Projects, Ministry of Agriculture and Land Reclamation, Egypt - met Dr. Ismahane Elouafi, Director General of ICBA, as well as the senior management and scientists of the center. The delegation was briefed about ICBA’s research-for-development initiatives in the areas of aquaculture and bioenergy, natural resources management, climate change adaptation, crop productivity and diversification, and policy analysis. During the meeting, Dr. Dionysia Angeliki Lyra, a halophyte agronomist, presented ICBA’s research efforts on Salicornia and its promising results in terms of yield under saline conditions of countries like the UAE. The delegation was impressed to learn about a recent breakthrough achieved by ICBA scientists in recording the highest seed yield of Salicornia. Following the meeting, the delegation toured ICBA’s facilities, including the Integrated Aqua-Agriculture System and Salicornia experimental fields. At the invitation of the Red Sea Governorate, it was also agreed that a team of ICBA experts will visit Egypt to identify areas for Salicornia production. This will be followed by developing a joint project and Memorandum of Understanding (MoU) for collaboration with the Red Sea Governorate and the Ministry of agriculture and other local agencies, to be signed in July 2018. Over the years ICBA has been working in Egypt through several projects, notably a project titled “Model for seed production of resilient salt-tolerant crop species for climate-smart agriculture”. Through this project, which began in 2015 and will be completed in 2018, ICBA has been promoting alternative climate-resilient crops such as quinoa in Egypt. Funded through the Securing Water for Food program by the United States Agency for International Development, the Swedish International Development Cooperation Agency, and the Ministry of Foreign Affairs of the Netherlands, the project has so far reached over 2,000 rural Egyptian farmers, including 1,000 direct beneficiaries. Under this project, a seed production model was also established for salt-tolerant crops including pearl millet. Moreover, there is an increase number of Egyptian farmers, especially women taking to salt-tolerant crops such as quinoa, thanks to joint initiatives by ICBA and local partners, specifically the Government of Egypt. In 2017, the project focused on rural women and families with a view to ensuring they also benefit from the initiatives; and towards this, a training course for over 150 participants, including 120 women was organized, to train them in the production and processing of food and feed from salt-tolerant crops. Since its establishment in 1999, ICBA has been identifying, testing and piloting resource-efficient, climate-resilient crops and technologies in marginal environments around the world. Through research and capacity-building initiatives, the center continues to deliver agricultural and water scarcity solutions in areas affected by salinity and water scarcity.